As a small business owner, you probably face tons of local competition. This is completely normal, and not a bad thing, as it keeps you on your toes. Competition forces you to innovate, grow, and challenge yourself. In the end, this plays a role in better business development. So, you’ve finally decided to give SMS marketing a try, mostly because your competitors have already mastered this tactic. Is it too late to make a mark in this space? Absolutely not. Just make sure you start by thinking outside the box. 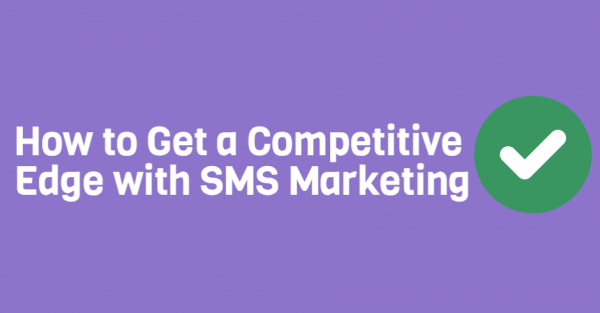 Don’t copy your competitor, or stick to cookie cutter SMS marketing methods. 1. Start off by observing your competition. What are they doing to grow their SMS list? What kinds of offers are they promoting? How are customers responding to opt in invitations? Gather as much information as you can, as this will help you learn what to do/not to do when growing your list. 2. One up their offer. Let’s say their opt in incentive touts a 20% off mobile coupon. Take it one step further, and offer 25% off. If you one up their offer, potential customers will notice your larger deal, and act accordingly. 3. Promote on different outlets. Let’s say the store down the street focuses on in store flyers, but doesn’t mention their SMS list on social media. This is a huge opportunity for you. Talk about your mobile rewards program on Facebook and Twitter. Tap into a market that is currently untouched. This prevents market saturation, and allows you to potentially reach a new set of eyeballs. Partner up with the best online texting service, Slicktext.com. Give us a call today at 1.800.688.6290 to learn more, or hop over to our pricing page to sign up for your free plan. We provide all customers with a feature rich platform and the educational resources needed to succeed.